Miss Eaves was my third grade teacher. She gets the honor of having this sandwich named after her, because it reminds me of my childhood (and because “Eaves” sort of rhymes with “cheese”). This post is nothing special or life-changing. It’s just a nice photo of something we all need from time to time. Make plain cheese sandwiches using regular sliced bread and Kraft singles (we call it slicker cheese in our house because of its resemblance to a yellow rain pancho). Heat a non-stick pan over medium heat and melt some butter in the pan. 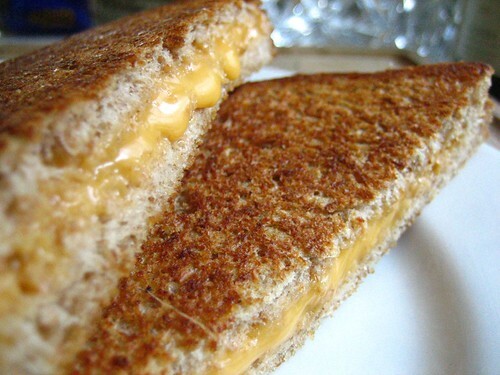 Gently cook the sandwich until golden on both sides. I smash the sandwich down right at the end (that’s the way my mom did it). Cut diagonally into two pieces. We ate these sandwiches with beef and barley soup for lunch. Good day. 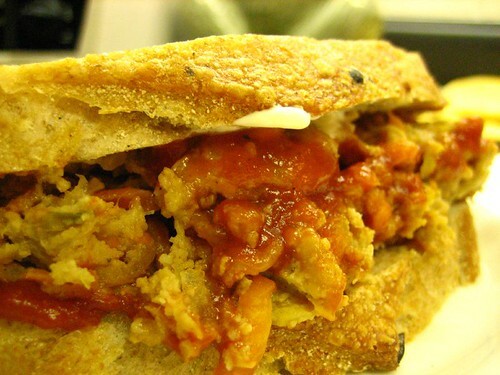 Ah…Meatloaf sandwich. It doesn’t get much better than that, but this post isn’t about my sandwich. It’s about the meatloaf. I make a few different kinds of ‘Loaf, but if it’s after work and I want to make it quick, I make meatloaf muffins. I throw an onion, 2 carrots and a celery stalk in the food processor and blitz it. Cook those vegetables until they’re soft. I use 1/2 lb. of ground chicken breast and 1/2 lb. of ground chick thighs. Mix the meat together, add an egg, 1/4 cup of bread crumbs, 1 tblsp. Worcestershire sauce, the vegetables and S&P (and maybe a little Tony’s). Portion the mixture into a muffin pan and back it for about 20 minutes at 350. While it’s cooking, mix 1 cup of ketchup, 2 tsp. yellow mustard, 1 tblsp. brown sugar and 1 tblsp. Worcestershire sauce and cook it on top of the stove until bubbly. Near the end of the meatloaf cooking, pull out the muffin pan and spoon over the sauce. Cook for about 5 minutes more. This is a great weeknight quick fix meal, and it makes delicious leftovers. 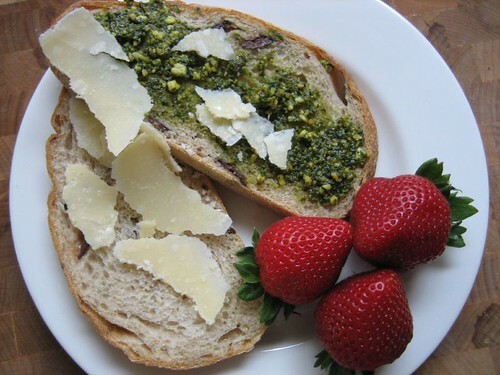 Calamata Olive Bread, Pesto, Shaved Parm and Strawberries, originally uploaded by blakekillian. We had a big lunch at Casa Garcia on Saturday, so last night I wasn’t too hungry. We went to Whole Foods after lunch, and bought some supplies for the week. We got some amazing Calamata Olive bread, some salty, buttery Parm/Reg and huge organic strawberries. Since we are being overtaken by basil, our fridge is never without pesto.